Some considerable time ago, I made an appeal in ‘Link’ for any information regarding the men whose names are inscribed on the Bishopthorpe War Memorial. There are fourteen men from the First World War and ten men from the Second World War. My intention was to carry out research into the lives of these men who made the ultimate sacrifice for their country; this with a view to producing a publication as a tribute to them. I am now in the latter stages of preparing the manuscript, with most of the research completed. However, in looking at all the information I now have at my disposal, I was disappointed to see how few photographs I have for publication. I had hoped to have an image of each man commemorated on the Memorial. Many of the photographs I do have are taken from very old newspaper copies, and not of the best quality. During the course of my research, I have found a number of other men, from both wars, who died as a result of war service. 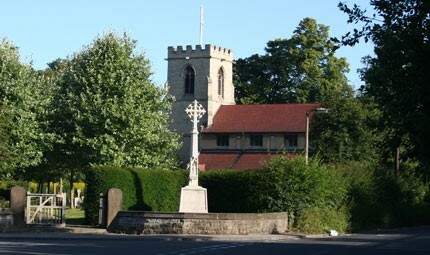 They would have been entitled to be commemorated on Bishopthorpe’s Memorial because they had either been born, or lived, in Bishopthorpe. As such, I shall include them in the publication. However, I also lack photographs of some of them and therefore include their names with the others below. I would therefore ask again if anyone has photographs of the following men, or is aware that such photographs exist, I would be extremely grateful if you could contact me with this information. Pictured left is Private C. W. Johnson’s grave in St. Andrew’s Churchyard, Bishopthorpe. This is a Commonwealth War Graves Commission headstone. Pte. 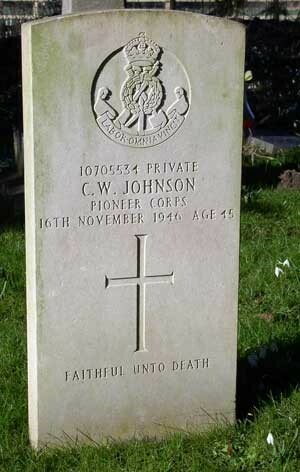 Johnson was with the Pioneer Corps and died 16 November 1946, aged 45. Alan Norman LANCASTER, Flight Sergeant. Ken Haywood: 39 Acaster Lane, Bishopthorpe, YORK, YO23 2SA.